CHICO, CALIFORNIA. Millions of Californians finished off their last packs on Wednesday, on the eve of the day that the new statewide smoking ban is scheduled to take effect. As a consumer panic hit cigarette retailers throughout the state, the second-hand smoke rising from San Diego to Happy Camp could be seen from satellite. Bravo, California! This calls for a party. You can bet that I, my wife, and our kids will celebrate this one. This moment gives comfort in the face of all the terrible news we’ve been buffeted with of late. Though I don’t look to the state for moral guidance, I am relieved when the state withdraws its bumbling paws from the personal lives of citizens. For that reason, this is an unquestionable victory for humanity, which is always an uncommon event that we must strive to appreciate. I’ve become so accustomed to feeling ashamed to be an American since 2003 that the taste of this news is made that much more sweet. It’s a great day to be a Californian. Reactionaries will doubtless see this as “judicial activism”. I guess that makes it a fight between the judge and the mob. The mob may fight back, and the mob may win, but this is a great day nonetheless. The Pacific and North American Plates, two of the world’s largest, collide from the Gulf of California to Shelter Cove, just south of Cape Mendocino, California. This collision, roughly delineated by the San Andreas Fault, is what put the place we call California on the map. The collision has a north-south orientation, with cool ocean currents flowing from the north. The collision occurs across a broad spectrum of tropical, subtropical, and temperate latitudes, from 23 to 40 degrees north. All this adds up to a mild, sunny climate. Add to that an occasional quake to keep everybody on their toes, and you have the California of the Padres. The massive Sierra Nevada traps large volumes of atmospheric moisture, leaving the lands to the east dry. It being a large mountain block, much of that moisture is stored as snow and ice, meaning that the moisture is released when it is needed most, during the warm, dry springs and summers. As that moisture is released, it carries with it the sediments that become the soils of the great Central Valley. As lady luck would have it, a smattering of that sediment is gold. 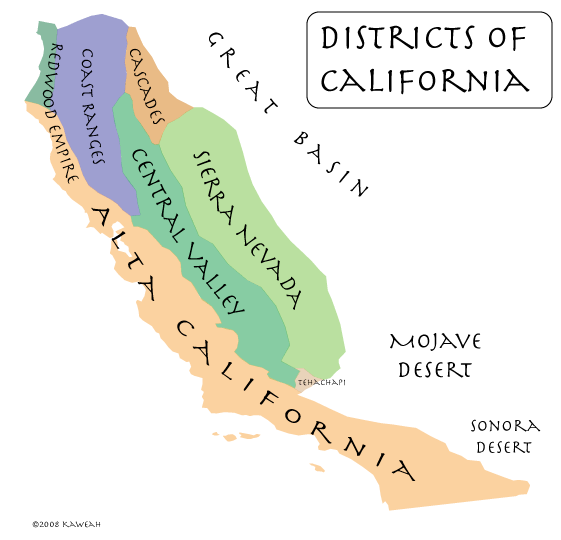 It was the glitter of gold in Sierra streams that set the tone for the future of California and America, just as that glitter brought the world to California before her greatest riches were discovered. Beyond the extravagance of gold and the practical benefit of water and soil, we must not forget the beauty and recreational value of Lake Tahoe, Yosemite, the High Sierra, and the Giant Sequoia (more on that to come). 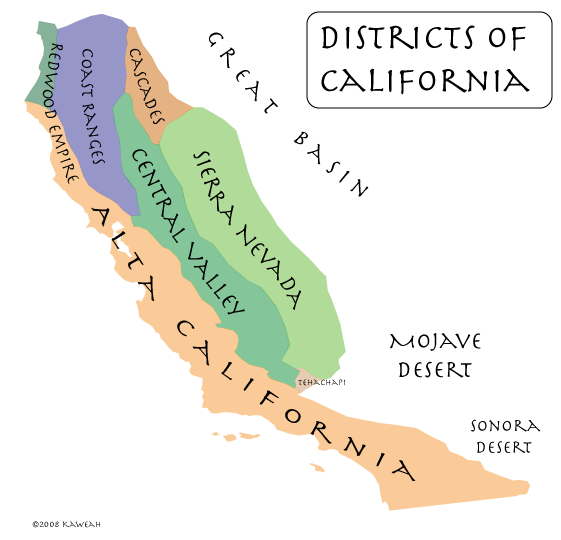 Without Sierra Nevada sediments, much of the Central Valley might be known today as the Central Sea, like the Sea of Cortes (the Gulf of California) to the south, but the Sierra Nevada does not entirely account for the Central land form of California, be it land or sea, and there are other mountains that feed the Central Valley. The Sacramento River is proof of that. The Sacramento River is fed by the southern end of the Cascade Range on east, and the Trinity Mountains and other ranges on the west. Another natural resource that plays a central role in the California myth is the California redwood tree, which lives along the western slopes of the Sierra Nevada and the Pacific Coast, from Big Sur the far southern Oregon. The east coast of Baja California. The crest of the Chocolate Mountains (just east of the San Andreas Fault). The crest of the Little San Bernardino Mountains. The crest of the San Bernardino Mountains. The crest of the San Gabriel Mountains. The crest of the Tehachapi Mountains. The eastern edge of the Sierra Nevada. The eastern edge of the Cascade Range. The boundary continues northward here to include the watershed of the Sacramento Valley. The crest of the Siskiyou Mountains. The northern boundary of the Smith River watershed. This is the approximate northern boundary of the region called “the Redwood Empire”.